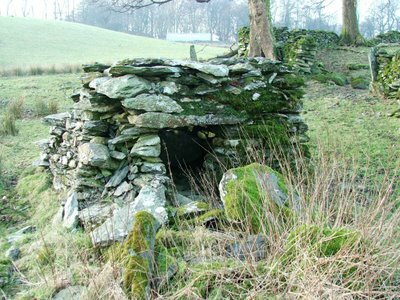 This site is about four miles outside Kendal, about a mile North East of Selside. Parking up on the left hand side of the road, the public footpath disapears through the wall to the right, down towards the river Mint. About 200 yards down the footpath, across the new route of the gas pipeline (watch the barbed wire!!!) and the site is on your right hidden in a copse of trees. It's very boggy to the East of the site, so make sure you've got your wellies with you!! The moated enclosure can be dated somewhere between 1066 and 1544, quite a large time frame I know, but it may have been inhabited, deserted and the inhabited again. The site consists of an inner bank running around two thirds of a moated island, a single earth bank on the South East side, and a double earth bank on the North West. The island is accessable from the North corner, but apparently traces of a causeway have been found in the Western corner.....although I couldn't find these remains!!! There are feint earthwork remains on the island (now merely a raised area in a boggy marshy area) To the South East of the moated area, lay the remains of the long house. These are by far the most impressive part of this site, and survive in places, to around a meter and a half high. 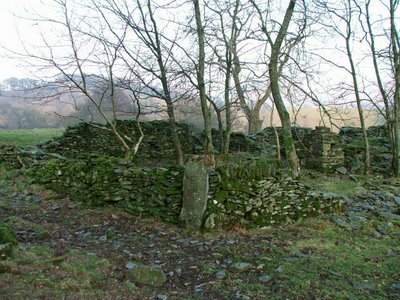 There are definitely two rooms to the long house, with piles of slate rubble where the walls have otherwise collapsed. 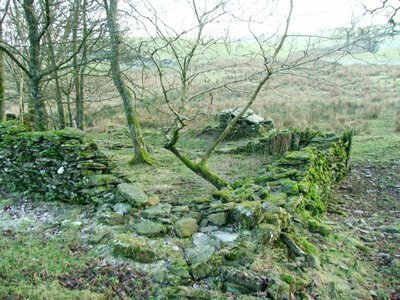 The remains of a charcoal burning pit have apparently been found in the area, although I was unable to track this feature down. I'm not sure if the moated site was a defencible structure, or just an enclosure for keeping animals. However, it was quite an impressive site at the end of a pleasant woodland walk.